Journey Man is a popular perfume by Amouage for men and was released in 2014. The scent is spicy-smoky. The longevity is above-average. It is still in production. Today I'm taking you on a journey. A trip that hasn't got a comment since 2 years and it's time again to write something about it. The following journey takes us to different places and in the background runs "Don't Stop Believin'"
Fun Fact - Don't Stop Believin' is a rock song by the US-American music band Journey, first released in 1981, but just by the way. "Just a few more minutes to lift off" - "I'm so excited"
"I guess this is the first time?" "No, I've been excited before"
"Gentleman may I introduce you to your Captain - Captain Over" - "Gentleman welcome aboard" - "Captain, your navigator Mr. Außer and your first officer Mr. Unter. -"Except" "Over" - "Over" "Under"
"We have clearance, Clerence! "-"Roger, Roger! What is our Vector, Victor? In the plane we first travel to Szechuan, where the pepper grows and is accompanied by finest bergamot and much spice by cardamom. Yes and quickly a smoke spreads, dense and fine that will surround us. But it's not the old turbopropeller engine we're sitting in. "There are problems in the cockpit." - "What is it? This is the little room on the front of the plane where the pilot is sitting. That's not so important now." Finest incense envelops us and it seems as if someone in the cabin is stuffing himself with noble sweet tobacco a pipe. Noble and sweet. We fly over Geraniol, an ethereal sea of flowers that seems to be on fire. More smoke coming up. However, no pope is elected, but one gets the impression to stand in a cathedral himself. "Nervous?" - "Yes!" - "Probably the first time?" - "No, I've been nervous before." For the guests there is first a Wachholderschnaps for reassurance. The scent warms additionally, nothing pricks or stings, you simply let yourself fall into soft leather. Not cool, but warm, and it hugs us now. "Today a telegram arrived from headquarters." "From headquarters? What is it?" "Well, this is a building where the generals usually meet and stuff. But that's probably not so important right now." On the seats in the plane which are made of the finest old leather, whose smell is already noticeable when you enter the plane and which is omnipresent, you look down on Cypriol and Ambrox with the bright tonka bean fields. A very beautiful sight, but it can happen that one or the other gets too much at the end. But it won't be that bad. "We have a bomb on board." - "A Bo...?" - "No, no Bo, a bomb!" Pepper will continue to come across from time to time, this keeps us all fresh and the smell stimulating. "Tell the captain now that we need to land as soon as possible. The woman must be taken to hospital immediately!" "A big building with patients, but that's not so important now." Dense incense combined with clear but fine leather and a touch of tonka bean fields will be the last thing you will notice when the journey slowly but surely comes to an end. "Captain, how fast can you land?" "Well, I can't say that!" "You can tell me, I'm a doctor!" "No, I meant I don't know!" "Well, not within the next two hours"
"You can't guess within the next two hours?"??" This is where this journey ends. Inspired by the film Airplane I leave you an impression of this quite opulent perfume, which seems to last as long as a trip to the Orient and is very suitable for autumn/winter. For going out and for the evening. A spicy smoky tobacco leather Orientale which despite an Alberto Morillas knows how to please. Not an isolated case, if he is not completely responsible for a fragrance, then it's usually something for me. "You don't mean that, do you?" - "Yes, of course I do! And please don't call me serious!" 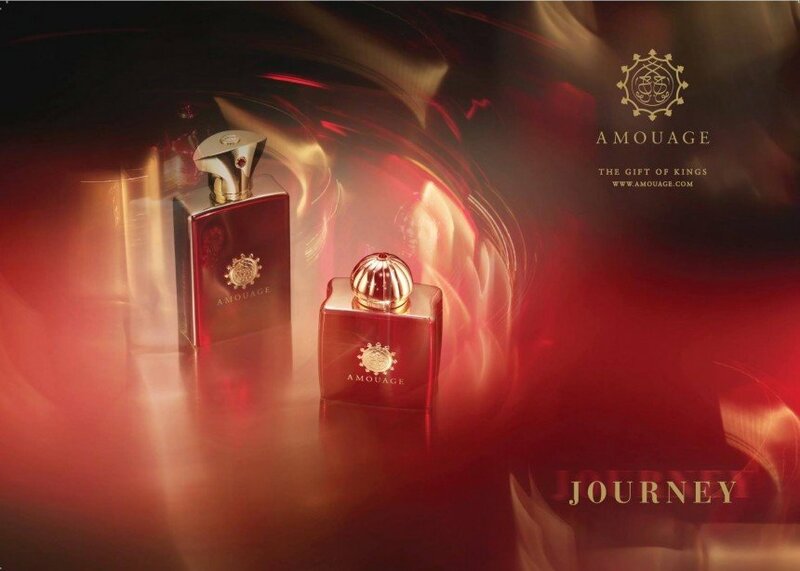 Amouage Journey takes you to the journey indeed. A journey on the Far East. Even the whole composition created by Alberto Morillas and Pierre Negrin has some sweet and sour tonality. It starts with sour citrus fruits and strong Chinese cuisine pepper. From the heart emerge tobacco and very calming incense. Tonka bean gives some fantastic low-intensity sweetness and new dimension to the scent. A good-mannered and harmonious fragrance. By its composition similar to Jubilation, but less flashy. Also by the sweetness similar to heavily sedated Interlude. Perfectly tweaked, every layer is where it should be. A formal and very mature scent, like 80s masculine fragrance after an Oriental treatment. Beautiful in its precision, but without the "wow" factor. “At first smell” Journey Man seems like a typical Amouage scent – having this woody-spicy and incense character. It is not the first time when the brand uses pepper, incense, musk, ambergris and lots more of other used in this recipe ingredients. It has to be admitted though that the Sichuan pepper essence smells stunningly beautiful, aromatic and vibrating here. Still the start-off would not be like it actually is if it was not for a quite big dose of cardamom, which in this amount appears for the second time in the Omani perfumes (previously, fans of this intense fragrance could be satisfied like that in 2010 when Opus IV was launched). This quite intense and ruthless pepper-cardamom start-off has been coated with a mix of bergamon and neroli. The heart incorporates vibrating molecules of juniper berries, which link the spicy pepper with dry-woody cypriol, smoky incense and strongly present note of tobacco. According to the list of notes we can find also here pure geraniol, subtle rose-smelling molecule that in nature appears, among others, in ripe tobacco (worth noting, cigarette manufactures use geraniol to scent their products). It is clear then that perfumers decided to strengthen and in a way to ripe the tobacco note by adding geraniol. These procedures that consist of mixing the natural aromatic essence with one or more aromatic molecules, which in fact are present in nature but in limited amounts, to strengthen chosen aspects of natural fragrance are quite common in modern perfumery. For the surprisingly strong note of tobacco we have to wait though. In my case it appeared after 3-4h after settling and when there is no more pepper and cardamom going on in the air and the smell itself starts to get more dry, rough and woody-incense. At this stage cypriol can be vividly smelled. This, as it turned out, became my favourite aromatic molecule responsible for this dry, powdery woody tones present in such smells like Opus VI by Pierre Negrin and Dora Arnaud and also Opus VII by Negrin and Alberto Morillas (the same duet that introduced Journey Man), Timbuktu by L’Artisan or deeply regretted Gucci Pour Homme. Nonetheless, Journey Man is partly penetrating similar olfactory regions as Michael Almairac’s perfume so I recommend this scent to all those keen on Gucci. The base is quite characteristic, mixing sweet and bitter note of strengthen with geraniol tobacco with a characteristic dry and woody note of cypriol. Everything intensified by tonka, musk and ambrox. During the last stage Journey Man resembles some other perfume which I reviewed earlier but unfortunately I cannot recall the name now. Anyway, the smell gets masculine, elegant and intriguing. It is really good. With every next try I come to a conclusion that the tobacco note is the dark horse of the whole composition. The note has been put into the whole smell perfectly, so when it comes to the fore, it smells incredibly – realistically but not in the negative way of course, at the same time it is intriguing and sensual. Above all it is purely masculine. The so called working parameters of the scent can be classified as very good. Sillage is very good. The smell as a whole is strong and vivid and during the first few hours projects around the bearer within a couple of meters and can be easily noticeable by interested environment. It has been 7 hours after I sprayed it onto me and I can still smell it quite vividly; the smell itself can last more than 12 hours. I did not like it too much, for me it is somewhat annoying the excess of spices (cardamom), that makes it too dry and very spicy. When the tobacco is perceived, it lowers something that smell of spices, which at some point I find annoying. After a few hours something is sweetened and is more bearable, the typical Amouage incense is hardly perceived. The best thing is the longevity and the wake without exhaustions, but for me it is not worth the expense for this perfume. Amouage Journey Man is my first serious adventure in niche frags world. The opening of this frag is very exciting and high quality with fresh notes of bergamot and neroli, softened by a soft cardamom note.The pepper note is not too much, just a hint of it is sensible. The juniper is also very well represented without too much sour smell. The dominant notes in this frag are Tobacco and incense. They're present from the beginning till end. The opening of Journey is the best part of it. Then as time passes, top citrus notes disappear and it becomes more bitter and a bit dark. The drydown is somehow smokey and bitter. Tonka, leather and musk are hardly noticeable. There is something unknown to me in the drydown, I think it is Cypriol. But again that arabian theme annoys me here in the drydown. Generally speaking, Journey Man is not a bad fragrance specially if you like tobacco and incense-based frags, of course plus a typical arabian theme. If you don't have any problem with that theme that's an ok frag. * By that arabian theme I mean a typical smell found in many classic arabic perfumes which is the result of the combination of musk and some arabian spices, frankincense(olibanum), mastique and ... . I'm pretty sure there is at least one of the above notes in Journey that is not mentioned in the pyramid of notes. However, in my humble opinion, it doesn't worth to pay 160-170$ for it. You can find better tobacco-based or incense-based frags with far less prices and good qualities as well. Update: Journey has a strong note of olibanum not listed in Basenotes and Fragrantica but it's listed here correctly. That typical and simillar arabian theme I told you about, is due to olibanum(frankincense). As a fragrance House, I always consider Amouage as one of the best along with Guerlain but I can't and I won't justify everything they offer especially this (Journey). This is the shortest Journey since I first bitten by the Fragrance bug, It starts and immediately ends with disappointment, thankfully did not buy it blind, there is nothing which can be related to Amouage , no frankincense, no Myrrh , no oud and no olibanum/ labdanum , its just a repellent spicy sweetness(Tonka) which along with Tobacco makes it very very dated and cloying. The first time I feel the quality of ingredients are very cheap and blending of no direction in an Amouage.Weird. Cant believe Its from the same house which created Epic , Jubilation, Dia or even Interlude. It seems as if Amouage is making changes in its perfume making strategy. Once its scents were very bold powerhouse masculines. Now, it seems that with the midnight flower collection and last year's Journey duo, Amoauge is trying to make polished scents that can be used as signature scents for the well dressed average (with a sense of style) consumer. Journey opens with a fresh yet spicy and smoky aroma. I say fresh because the the bergamot and neroli give it a fresh and a minute soapy edge and spicy because the sichuan pepper is the star of this fragrance. As time passes one is treated to a nice (yet repetitive and familiar) tobacco note that is paired with cardamon and incense. The base is relatively generic as it is composed of musk ,leather, and tonka beans. From my review it may seem that I thought of Journey as an average fragrance, but that is not the case. It is a classical smelling fragrance (as if from the late 80's) done very very well. 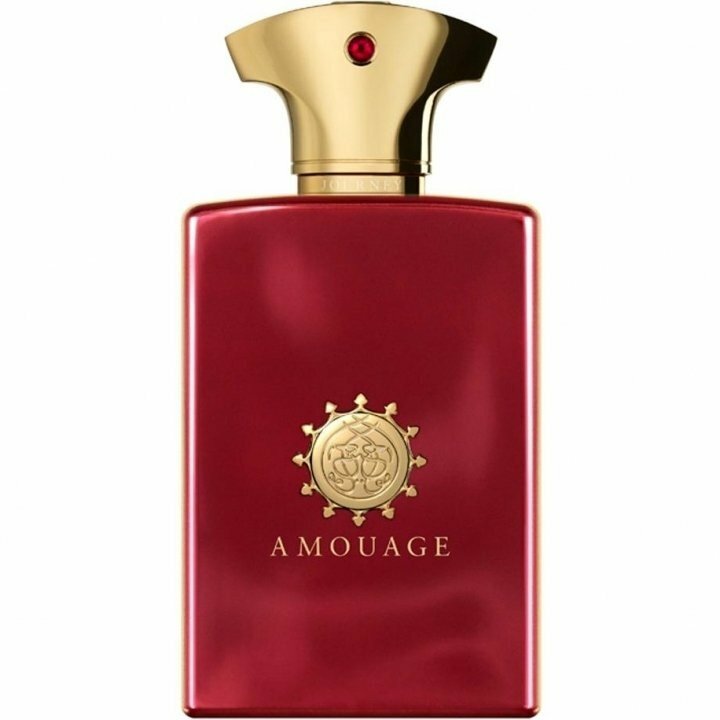 The projection is above average and so is longevity but is sub-par based upon Amouage's standards (which as I said is because Amouage is trying to make this mainstream and versatile and isn't necessarily a bad thing). A good Amouage for even those who previously disliked this Omani brand's offerings. The opening of Journey Man is fantastic: a zesty, vibrant citrus-green accord with fresh herbs, pine needles, pungent spices (mostly juniper and pepper), a subtle fruity note on a velvety, shady tobacco-woody-leathery base – that common type of nowadays’ leather, glossy and “clean”, chemical and bright, yet mellow and pleasant, blending with tobacco to create a refined feel of black smoke well contrasting with herbs and citrus notes. This scent is peculiar indeed: it’s “black” and smoky on one side, but somehow it smells really crisp, bright and vibrant, almost radiant even if it’s mostly about "shady" notes. The feel is like going out dressed in black leather on a sunny spring day, with your dark outfit being enlightened by the sunrays and the azure sky. It also has a really clean look and texture, this meaning it smells quite simple and neat (not a flaw for me, as long as it smells good). Also, as many reviewers already noted, the connection to classics is evident, as Journey Man’s roots are clearly and strongly dating back to several leathery-smoky-herbal fougères, from Krizia to Eucris by Geo Trumper. The only thing I don’t enjoy is a slight but persistent sort of chemical-metallic aftertaste, but overall it’s really pleasant, especially for the first hour or so. Being quite linear, though, after a while it starts to smell a bit boring, losing a bit of the first-sniff “sensation”. Shortly a nice and well-executed tribute to an era, with a contemporary feel, undoubtedly good-quality ingredients and a solid composition. Sophisticated and “smelling expensive”, yet versatile, easy-going and safe all-year ‘round. The price is completely insane, but at least the scent smells nice, so you won’t regret it (that much). The journey from the peppery citrus over insence to sweetish leather. Well done, but without any adventures and surprises.